Whether you have a few or all of your teeth missing, a solution to filling these spaces is with a denture. A denture is made from a hard-wearing acrylic material that mimics the look of teeth and gums to give your mouth a natural appearance. After impressions are taken, there are a number of stages involved in ensuring your 'bite' is set up correctly and you are happy with the colour and shape of the teeth provided. The construction of a denture requires your dentist to work closely with a dental technician who constructs each stage of the denture by hand in a dental laboratory. The dentures fit over your gums and between the teeth, and can be removed for daily cleaning. When you wear a denture for the first time it may take some getting used to when speaking or eating and chewing. It is important that you take extra care when conducting your hygiene regime so that you can avoid bad breath, tooth decay and gum disease. The dentist will be able to show you how to best take care of your denture and gums to opimise your oral health. 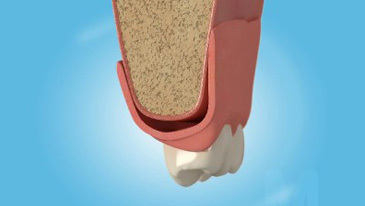 Immediate dentures enable the dentist to extract a tooth and 'immediately' fill the space with a denture. Usually impressions are taken at the first appointment, then the tooth is extracted and the denture fitted in the next appointment. The advantage of this treatment is it prevents the patient being left with a space whilst the denture is being constructed. There is no alternative dental treatment which can be provided to immediately replace a tooth. However, the disadvantage of such a treatment is that the dental technician must employ an element of estimating the contour of the gum, following the extraction of teeth. Although highly trained, with a great level of experience, it must be appreciated that an immediate denture never has a perfect fit. In addition healing and resorption rates vary between patients, meaning immediate invariably need replacing. Although the gum often heals in a matter of weeks, the underlying bone takes up to 3- 6 months to heal. As the bone heals the gum becomes a different shape to the fitting surface of your denture, and therefore the denture can become slacker and increase in movement. This can either be resolved be relining the denture, but often a new denture is required. It is not possible to predict the level of bone change that will occur as this varies greatly between patients. When constructing a new denture it is best to wait until full bone healing has occurred and the contour of the tissues is stable prior to producing a new denture, or there is a continued risk of further bone change. If a reline or new denture is required after bone healing a charge of the relevant treatment band is applicable on the NHS. A solution to replacing several missing teeth. Designed to give you a natural-looking smile. The NHS provides treatment which aims to restore your dental health and function. NHS dentures are often constructed of acrylic, and may include clasps to improve retention. Private dentures aim to restore function and enhance comfort and aesthetics as much as physically possible with a prosthesis. The quality and appearance of Private acrylic dentures is often superior to that of NHS acrylic dentures, as a great deal more time and advanced techniques are used during their laboratory construction which enhances their strength and aesthetics. These are cast metal dentures generally considered to be the more permanent partial denture unlike plastic partial dentures are clipped to the natural teeth with clasps and most importantly incorporate rests on the teeth. The clasps hold the denture firm and the rests stop any damaging up and down movement. Chrome-cobalt dentures are far superior to plastic partial dentures because they are thinner and the gums stay healthier because the biting force is shared between the gums and the remaining teeth. In certain designs we are able to have an open palate allowing improved taste and temperature sensation during eating. Cobalt-chrome dentures are not recommended in patients who are not dentally stable or suffer from gum disease. They are specifically designed meaning it is often difficult/not possible to add subsequent teeth which may be lost onto the existing metal framework. 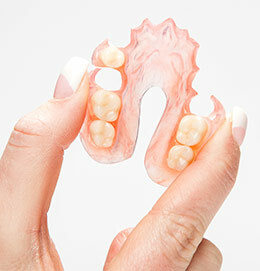 These are flexible dentures which often offer superior comfort compared to acrylic dentures. They have the additional benefit that 'gum coloured' clasps can often be provided which significantly improve the appearance compared to the metal clasps added to acrylic or cobalt-chrome dentures. As with cobalt-chrome dentures, these are only recommended in stable patients where future subsequent tooth loss is not high risk, as addition of further teeth is difficult and often a new denture is required.